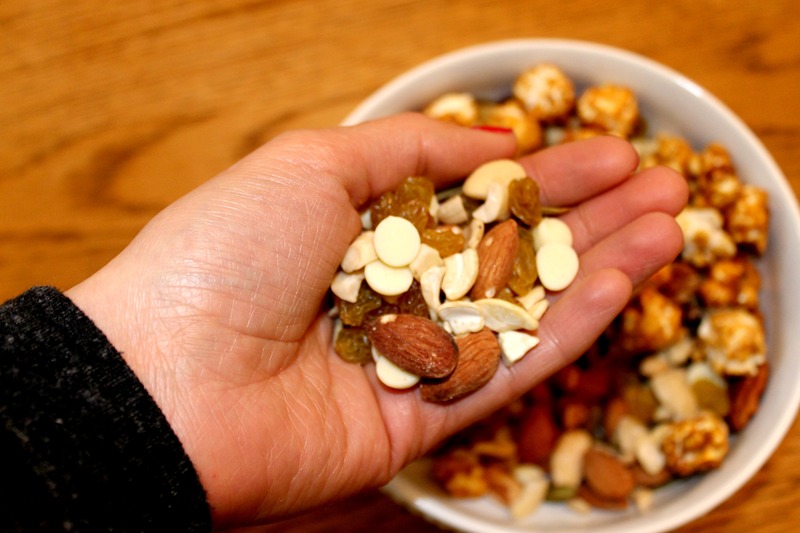 One of my favorite grab n’ go snacks is trail mix. It’s a great way to sneak in some healthy fats and protein when you are in a bit of a rush. I used to buy the prepackaged trail mix at places like Trader Joe’s and Whole Foods, but when I noticed that my wallet was taking a hit, I decided to take matters into my own hands and make my own healthy trail mix. 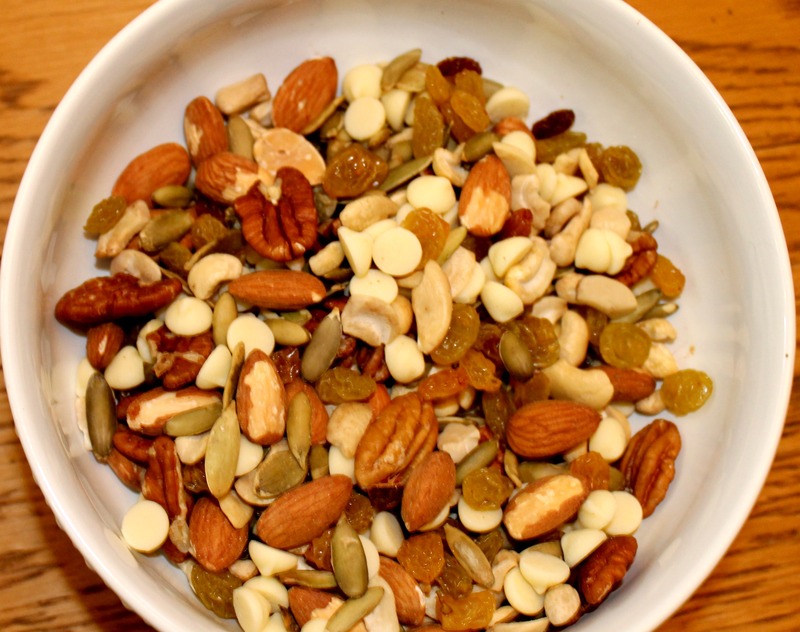 When I put together a healthy trail mix I usually include a few varieties of nuts, some seeds, dried fruit and a few chocolate chips for some sweetness. The Englishman loves taking trail mix to work so I made an extra large batch for him to enjoy throughout the week. This may not be the most complicated recipe around, but it sure is delicious. Pour all your trail mix ingredients into a bowl. Enjoy by the handful. For the Englishman’s batch I also added some caramel corn to the top for added crunch and texture. I unfortunately cannot have caramel corn, but the Englishman said it was a delicious addition. So apparently popcorn in trail mix is a good thing. What’s your favorite trail mix combo? 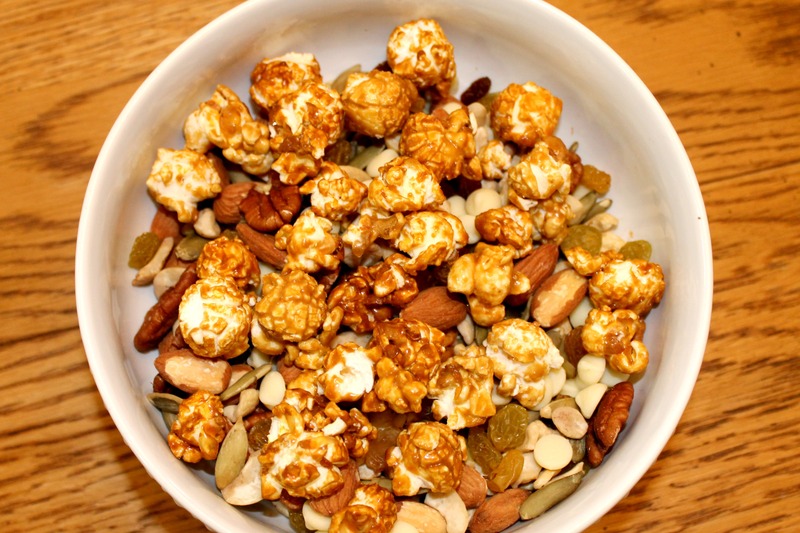 This entry was posted in Gluten-Free, Good Eats, Healthy, Snacks and tagged Trail Mix on January 9, 2014 by allie@sweetpotatobites. I like that Joe added popcorn to his. My sister and I were talking about having a trail mix making station at my nephew’s bday party, but were concerned that it could get really expensive with nuts being so expensive. But then we figured we could think outside the box and include pretzels and rice cereal (since it’s for kids). Not only cheaper but lower in calories! I really need to try this! My boyfriend takes a pack of trail mix to work with him everyday and it really adds up! Plus this way you get to pick everything that goes in!